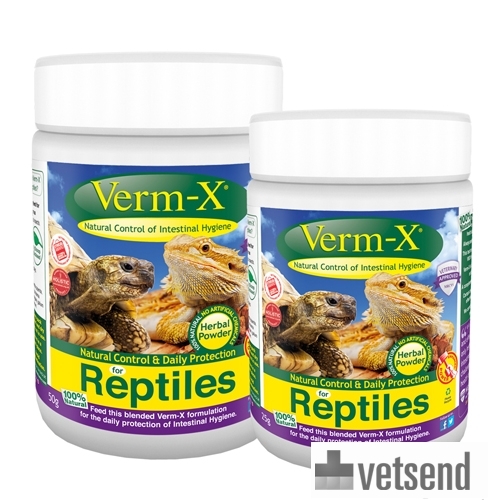 Verm-X for Reptiles (100% natural formula) provides effective support for intestinal health. Which reptiles is it suitable for? Turtles: as turtles are often kept outside, the risk of infection is greater than for indoor reptiles. Chameleons: when your chameleon basks in the sun, it may ingest flies that carry parasites. Snakes: these reptiles are at risk of parasites from consuming contaminated prey. You can also use Verm-X for snakes by simply sprinkling the powder on their prey or food. Allium sativum (garlic), thymus vulgaris (thyme), Picrasma excelsa (Quassia), Foeniculum vulgare (fennel), Mentha piperita (peppermint), Galium Aparine (cloves), Urtica dioica (nettle), Ulmus fulva (slippery elm), Cinnamomum zeylanicum (cinnamon), Capsicum minimum (Cayenne). Administer the Verm-X powder for 3 consecutive days per month on insects and live prey or greenery. In each package, a 1 g scoop is included. A 25g pack is sufficient for 1 year of treatment in small reptiles. Extensive studies show that this effective formulation is easy to administer, and also very tasty! Keep in a cool dry place after opening, and use by expiry date. Please note: this product is not comparable to a normal worming treatment. If you do want to use Verm-X as a replacement for a worming treatment, please have your veterinarian carry out a regular examination on your pet's faeces. Have you used Verm-X for Reptiles before? Let us know what you think about this product.